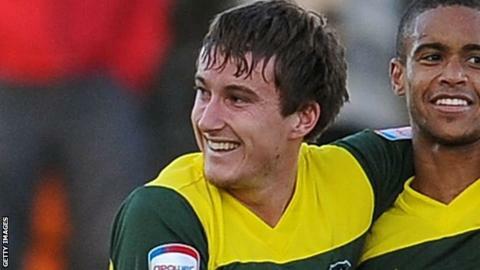 Torquay United captain Luke Young says the side must be more consistent. The Gulls are three points outside the play-off places, but have not won back-to-back games since a six-match run of victories in the middle of September. They have lost eight points through conceding goals in the last 15 minutes of games since that run came to an end. "It's trying to find that bit of consistency and try and turn those draws into wins and those losses into draws," Young told BBC Sport. Torquay are 10th in the Conference, but are one of six sides three points or fewer behind Macclesfield, who currently occupy the final play-off position. The Gulls would be higher had they not on Tuesday or conceded two goals in the final five minutes when they last month. "We're still in a position where we feel we can do something this year, and if you look at the table we're totally not out of it," said Young. "When you've played so well for 85 or 90 minutes of the game and all of a sudden a goal goes in where you either lose it or draw, everyone thinks 'it's happened again'. "But we've got ourselves in that position through hard work and everyone sticking together." He added: "It's just sometimes those other teams getting that rub of the green late on and piling the pressure on us, and trying to get that late equaliser or late winner. "It's obviously frustrating when that happens, but everybody's learning from it and we've just got to take it on the chin and put it right for the next games."